This artist's illustration shows a cross-section of the planned Commercial Space Station envisioned by Russian companies Orbital Technologies and RSC Energia. This story was updated at 1:40 p.m. ET. Two Russian aerospace companies are teamingup to build what they say will be the "world's first commercial spacestation" ? an orbiting outpost open to private citizens, professionalastronauts and scientists. For a price. Thecompanies announced plans for the new space station today (Sept. 29) butdid not reveal an estimated cost. The space station is expected to launch sometimebetween 2015 and 2016. The cost of individual trips may vary based on launchvehicle, duration and purpose of missions. "Oncelaunched and operational, the CSS will provide a unique destination forcommercial, state and private spaceflight exploration missions,? said OrbitalTechnologies chief executive Sergey Kostenko in a statement. "The CSS willbe a valuable addition to the global base of orbital assets." Medicalexperiments and Earth observations are just some of the services the spacestation is expected to offer. Space tourism, Kostenko said, is another bigfield. ?Wealso have proposals for the implementation of media projects," he added. "And, of course, some parties are interested in short-duration stays on thestation for enjoyment.? Moscow-basedOrbital Technologies is a company of engineers, scientists and space industryveterans dedicated to opening space for private enterprise, according to itswebsite. RSCEnergia is the largest contractor serving Russia's Federal Space Agency and hasextensive experience building space station modules and spacecraft. The companybuilt Russia's Salyut space stations, the multi-module Mir Space Station andmajor Russian elements of the International Space Station. RSC Energia alsobuilds the Soyuz and Progress spacecraft that launch routinely to the International SpaceStation. VitalyLopota, president of RSC Energia, said the company has 40 years of experiencebuilding space stations and has been outlining plans for the Commercial SpaceStation for more than 10 years. Thenew space station would have an initial design life of about 15 years, OrbitalTechnologies officials have said. Soyuz spacecraft would ferry crews to thestation, while unmanned Progress vehicles would keep it stocked with supplies. Thestation will also fly in an orbit about 62 miles (100 km) from theInternational Space Station and in a similar inclination, or tilt, to make anytransfers of crew or cargo between to two stations easier, the company said. Thecompany's description of the station do not specify its power systems, howevera spokesperson told SPACE.com the initial module would have systems similar tothe Zvezda service module on the International Space Station. The RussianZvezda service module is equipped with solar arrays and thrusters for attitudecontrol. The Russian announcement comes amid a majorpush for commercial space vehicles and rockets in the United States, where atleast one company ? the Las Vegas-based Bigelow Aerospace ? is planningcommercial space stations of its own. BigelowAerospace has already put two prototype space station modules in space, calledGenesis 1 and Genesis 2. The modules are inflatable craft that launched in 2006and 2007 and both remain in orbit. Thecompany is aiming to have a full-scale private space stationin orbitand ready to receive customers by 2015, according to past reports. 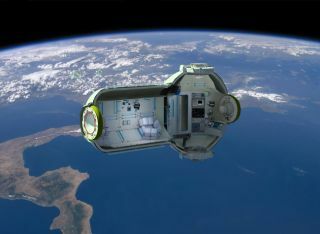 If so,Bigelow Aerospace's inflatable space station modules would snag the title ofthe world's first commercial space station in orbit if it launches beforeRussia's Commercial Space Station. Anothercompany, Excalibur Almaz in the Isle of Man, is planning to use spacecraftoriginally designed for the Soviet-era Almaz space stations to offer weeklongorbital spaceflights for paying customers. TheU.S. push for privately built spacecraft comes as NASA plans to use commercialspace vehicles to ferry astronauts to the International Space Station once theagency's space shuttle fleet retires in 2011. TheCommercial Space Station plan has also sparked interest in Russia's FederalSpace Agency. "Weconsider the Commercial Space Station a very interesting project, encouragingprivate participation," said Vitaly Davydov, deputy chief of the FederalSpace Agency. "It will attract private investment for the Russian spaceindustry.? TheRussian space agency's chief, Alexey Krasnov, added that a commercial spacestation could serve as a backup for International Space Station crews. "Forexample, if a required maintenance procedure or a real emergency were to occur,without the return of the ISS crew to Earth, habitants could use the CSS as asafe haven,? Krasnov said. Asplanned, the Commercial Space Station would use a universal docking system thatcould accommodate spacecraft from Russia, the United States and Europe, OrbitalTechnologies officials said. The station also is expected to accommodateChina's Shenzhou space capsules, which have flown three manned missions since2003. Thespace station could serve as a springboard for even more ambitious voyages intodeep space, Kostenko said. "A short stopover at our station will bethe perfect beginning of a manned circumlunar flight," he added. "Deep-space manned exploration missions planned in the next decade arealso welcome to use the CSS as a waypoint and a supply station."